" Recolor Black Getter - false news? 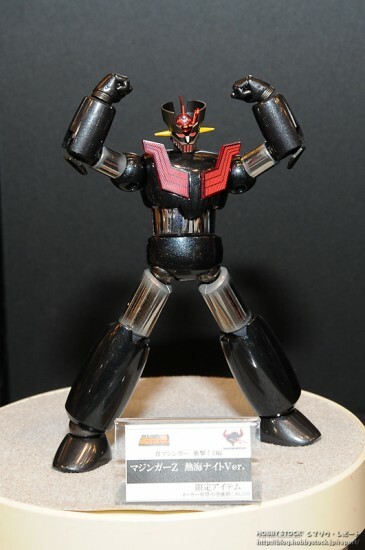 Announced the new limited Soul of Chogokin for the exhibitions Tamashii Nations 2009 Autumn (scheduled for early October): ... another Zetto is very similar to the previous Psycho Gundam Hong Kong Night. The style is in fact that of the GX-01RB, and fully chromed. Atami is the city that is involved in the first fight of Mazinger Z in the new animated series. The fight takes place at night, so it Atami Night. The pectoral plates have that effect, because I'm about to launch the breast fire. Does anyone have any idea of ​​the price you can get this version? Exactly! As Garion said the model reproduces the appearance of the mecha combat against Doublas M2, while in the night on the city of Atami Zeta are about to download the breast fire on the opponent! Very nice, I think I'll try to get it! the soc dedicated to the city 'of atami not' nice but rather 'e'stupendo. 've seen today for the first time and I must say I was bowled "on yia damask." quotes aside and' a gem that not I'm looking forward to have in mani.a mazinga are not in a bad way "gx 01, gx01r, black mazinga, gx07ova, iron z, z shin mazinga, gx02r, and 01r which I have done" tuning "l ' I completely disassembled I modeled the head as I liked it, draws painted with white and black "as in the carton leaving the forearms bleu, well, the result has exceeded my expectations" beautiful. "name; mazinga z x.
ok way you do in this place also featured!!! You say you will have the Scrander?